A hypergolic mixture ignites upon contact of the components without any external source of ignition (heat or flame). There are relatively few instances where this is a desirable event...unless you're a rocket scientist or weapons designer. Accidental mixing of incompatible materials can lead to a fire or explosion. Here's one example witnessed by the staff at ILPI of what can happen when incompatibles are mixed. Always read the labels on your bottles (don't assume a chemical's identity by the shape, size or color of the bottle), and know what materials are incompatible with the chemicals that you are using. 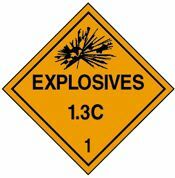 Get your DOT explosives placards (in 5 different materials), placard systems and labels at Safety Emporium. Fuel Propellants - Storable, and Hypergolic vs. Ignitable at permanent.com. A brief discussion of hypergolic propellants at NASA. NASA's White Sands Test Facility offers specialized expertise in Hypergolic Propellant Handling.